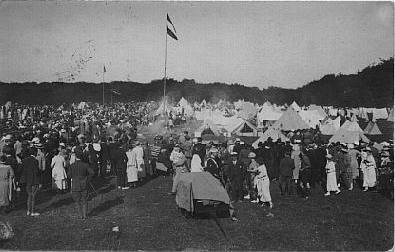 The Second World Jamboree took place in Denmark, and was cut into two periods. The first period from 10 - 17 August there was a camp at Ermelunde, not far from Kopenhagen. 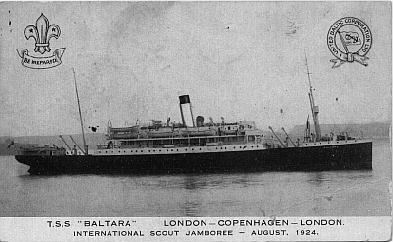 The British contingent arrived in the TSS Baltara. Even though there was a special Jamboree Post office at the Jamboree, situated in a tent, no special cancels have been used for the Jamboree. 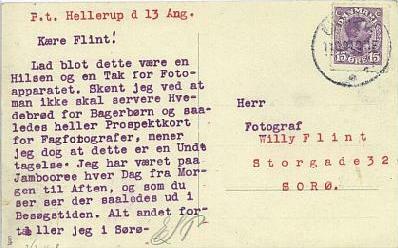 All mail from the Jamboree was sent to the nearest Post office at Gjentofte, to be canceled there. This makes it very difficult to recognize mail sent from the Jamboree. 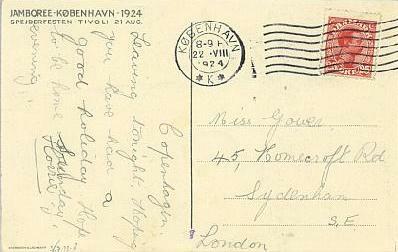 Mail from the Jamboree must have a Gjentofte cancellation and it must either be recognizable by it's text or it must be a Jamboree Postcard to show that it was sent from the Jamboree. 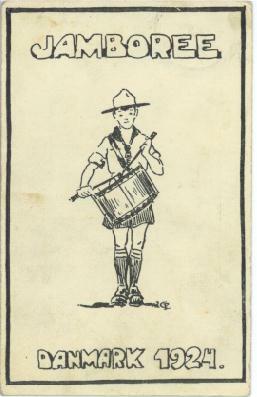 This Jamboree postcard was sent from the Jamboree on August the 9th to Budapest in Hungary. Unfortunately the postal employee missed the card with the canceller, which is a pity but still a nice item for a collection. 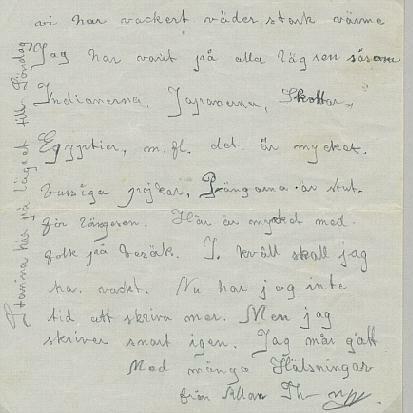 A letter sent from the Jamboree to Sweden, canceled Gjentofte 12.8.24.4-5E, so cancelled in the right period for being a possible Jamboree item. (it might just as well be from someone that lives in Village of Gjentofte) . 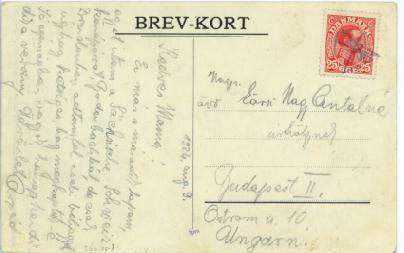 Luckily the letter is still inside, parts of the letter are: Ermelunde august 12 1924 dear parents I arrived here on Sunday, 3 o'clock and all is well. We have a lot to do with tents and many other things..... I have visited all the camps like the Indians, the Japanese, the Scottish, the Egyptians, amongst others...... This evening I am on guard.... will stay in the camp until Sunday. All in all a nice letter sent from the Jamboree. 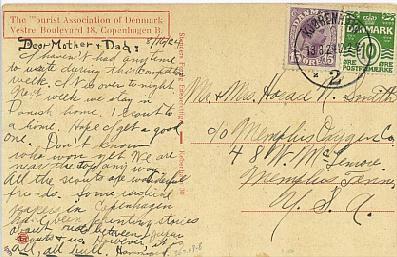 This Postcard was sent on august the 13th, showing a visitors day at the Jamboree, the text reads (amongst other) I have been at the Jamboree every day from morning to evening and as you can see this is what it looks like at visiting hours. 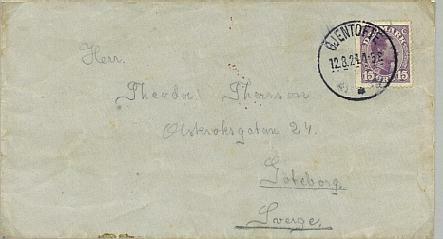 The cancel reads: Gjentofte 13.8.24.9-11F. 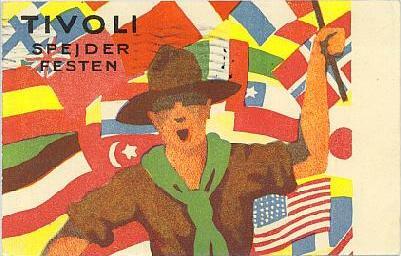 over 4,500 scouts participated in this Jamboree they came from 33 countries. During the first week of the Jamboree there was a mail flow of 25,163 outgoing and 14,238 incoming items.